As European soccer stars compete in the European Championship, the eyes of the world must turn to a soccer star at urgent risk of death: Palestinian national team member Mahmoud Sarsak, 25, has been imprisoned under Israel’s “Unlawful Combatants Law” – the only prisoner so held – without charge or trial – for three years. Sarsak, from Gaza, traveled to the West Bank to join the Palestinian national soccer team for training. Upon his arrival he was abducted by the Israeli occupation military and since that time has been held in Israeli jails, subject to this special version of administrative detention designed especially for Palestinian prisoners from the Gaza Strip. Take action now – send a letter to Israeli officials demanding his freedom! Mahmoud Sarsak launched his own hunger strike demanding freedom following the strikes of administrative detainees Khader Adnan and Hana’ Shalabi, on March 19 of this year. He was joined by thousands of other Palestinian prisoners on April 17. When the prisoners’ general open hunger strike ended on May 14 with an agreement, Sarsak continued his strike; his situation was particularly precarious due to the unique form of administrative detention under which he is held. Despite the urgency of his condition, the Israeli Prison Service (IPS) has denied Mahmoud access to independent doctors from PHR-Israel until today. The IPS also refuses to transfer him to a civilian hospital for proper treatment. Following today’s visit, the PHR-Israel doctor reported that Mahmoud has experienced extreme loss of muscle tissue and drastic weight loss. He has lost 33 percent of his body weight, from an original weight of 76 kilos down to his present weight of 51 kilos. He also suffers from frequent incidents of fainting and loss of consciousness, in addition to lapses in memory. The doctor further reported that Mahmoud is in danger of pulse disruptions (arrhythmias) that are endangering his life. Palestinian human rights organizations have urgently called for international action and solidarity for Mahmoud Sarsak – and for his fellow continuing hunger strikers, Akram Al-Rikhawi, on his 57th day of hunger strike, and Samer al-Barq, who renewed his hunger strike (following his participation in the April 17-May 14 general strike) on May 21 in protest of Israeli continual violations of the agreement – rather than being released as promised, his administrative detention was renewed. We are still here, continuing our open-ended hunger strike and that battle has not endeddespite 78 days of strike for one of us, and 59 days for the other. Protests have taken place across Europe and more action is urgently needed. 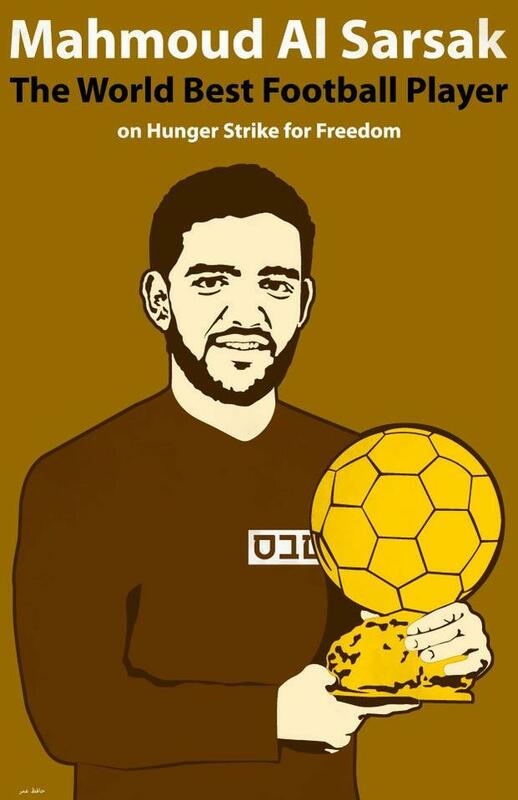 As the world’s eyes are on the best in soccer, take action for a true football hero – Mahmoud Sarsak – whose life is on the line for his freedom, and for dignity and justice for all Palestinians. 2. Join a protest or demonstration for Palestinian prisoners. Many groups and organizations are holding events – join one or announce your own. Organizing an event, action or forum on Palestinian prisoners on your city or campus? Use this form to contact us and we will post the event widely. If you need suggestions, materials or speakers for your event, please contact us at samidoun@samidoun.ca. 3. Contact your government officials and demand an end to international silence and complicity with the repression of Palestinian political prisoners. 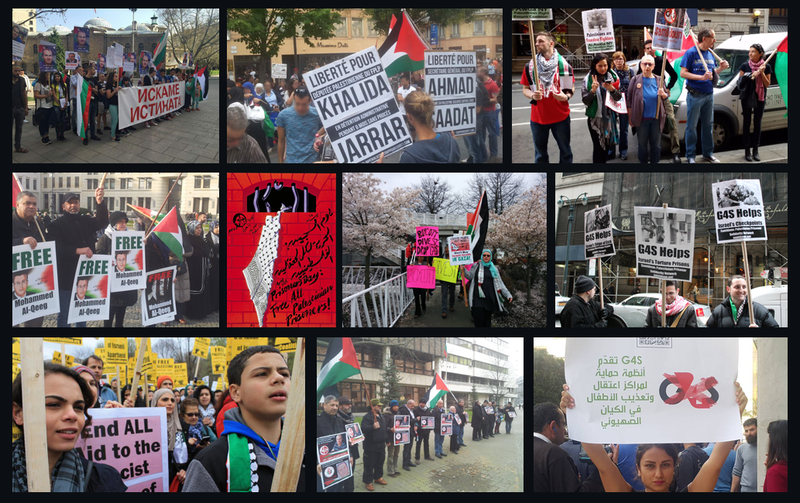 In Canada, Call the office of John Baird, Foreign Minister, and demand an end to Canadian support for Israel and justice for Palestinian prisoners, at : 613-990-7720; Email: bairdj@parl.gc.ca. In the US, call the office of Elizabeth Jones, Acting Assistant Secretary of State for Near East Affairs (1.202.647.7209). Demand that Elizabeth Jones bring this issue urgently to his counterparts in Israel. This action is now closed. Thank you for your support and congratulations to Mahmoud Sarsak.